HP Umpire Jim Wolf ejected Blue Jays Manager John Gibbons for arguing an ejection no-call (Unsportsmanlike-NEC) in the bottom of the 7th and Blue Jays P Aaron Sanchez and Bench Coach DeMarlo Hale for throwing at Royals batter Alcides Escobar in the top of the 8th inning of the Royals-Blue Jays game. In the 7th, with one out and two on, Blue Jays batter Josh Donaldson took a 2-2 fastball from Royals pitcher Ryan Madson for a called third ball. Replays indicate the pitch was located high and inside and followed preceding batter Troy Tulowitzki's hit-by-pitch and earlier warnings issued, the call was irrecusable. In the 8th, with two out and none on, Royals batter Escobar took a 2-0 fastball from Blue Jays pitcher Sanchez for a hit-by-pitch. Replays indicate the pitch was located inside and hit Escobar in the lower leg, the call was irrecusable. At the time of Gibbons' ejection, the Blue Jays were leading, 2-0. At the time of the latter two ejections, the Blue Jays were leading, 3-0. The Blue Jays ultimately won the contest, 5-2. These are Jim Wolf (28)'s first, second, and third ejections of 2015. Jim Wolf now has 6 points in the UEFL Standings (0 Previous + 3*[2 MLB + 0 Irrecusable Call] = 6). Crew Chief Angel Hernandez now has 5 points in Crew Division (2 Previous + 3 Irrecusable Call = 5). These are the 143rd, 144th, and 145th ejections of the 2015 MLB Regular Season. 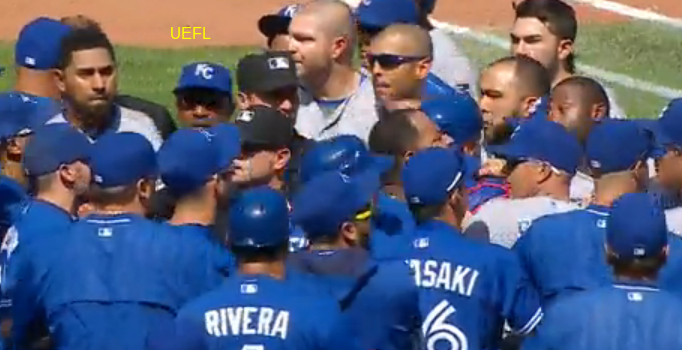 This is the 66th Manager ejection of 2015. 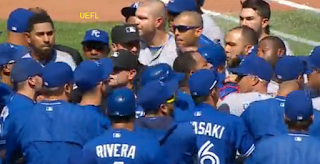 This is the 67th player ejection of 2015. Prior to ejection, Sanchez's line was 0.2 IP, ER. This is the Blue Jays' 7-9th ejection of 2015, 1st in the AL East (TOR 9; BOS 8; BAL, NYY 4; TB 3). This is John Gibbons' 4th ejection of 2015, 1st since July 2 (Gerry Davis; QOC = U [Replay Review]). This is Aaron Sanchez's first career MLB ejection. This is DeMarlo Hale's 2nd ejection of 2015, 1st since June 19 (CB Bucknor; QOC = U [Throwing At]). This is Jim Wolf's first ejection since July 25, 2011 (Jim Leyland; QOC = Y [Balls/Strikes]).